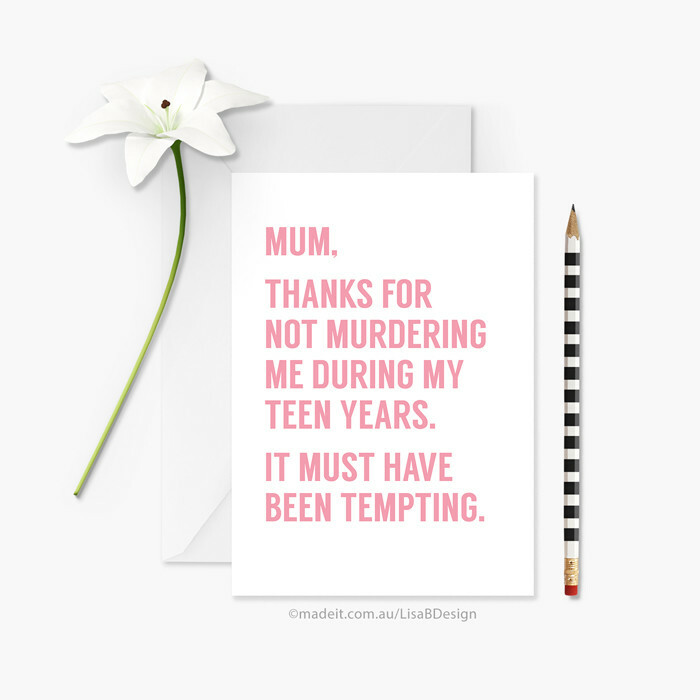 Mum / Mom / Dad, thanks for not murdering me during my teen years. 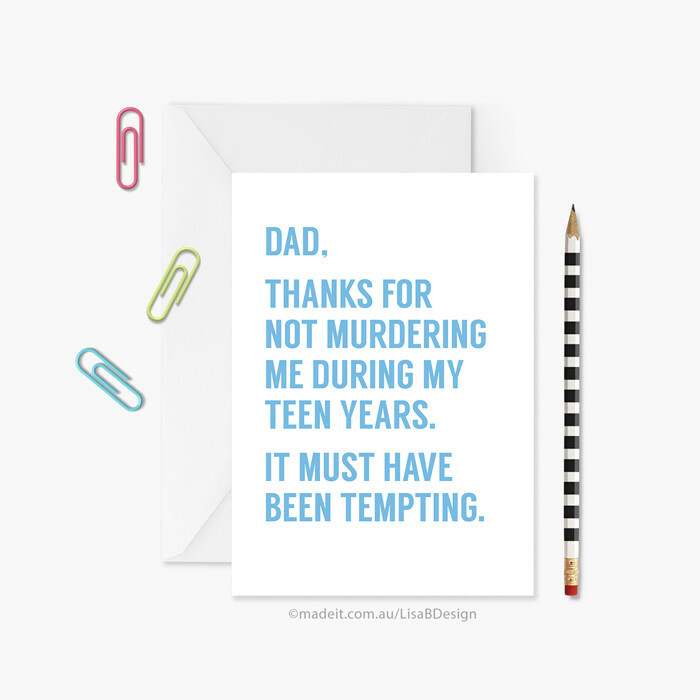 A funny custom card perfect for Mother's Day or Father's Day! Also suitable as a funny birthday card. Please include which spelling you would like (mum, mom, or dad) in the 'message to seller' section during checkout. PLEASE NOTE: This item is made to order so I cannot offer refunds or exchanges once item has shipped. ➤ NEW! Choose whether to send the card directly to you or the recipient. Please let me know if you want me to send it straight to the recipient in the ‘message to seller’ section during checkout and enter their address, otherwise it will be addressed to you. 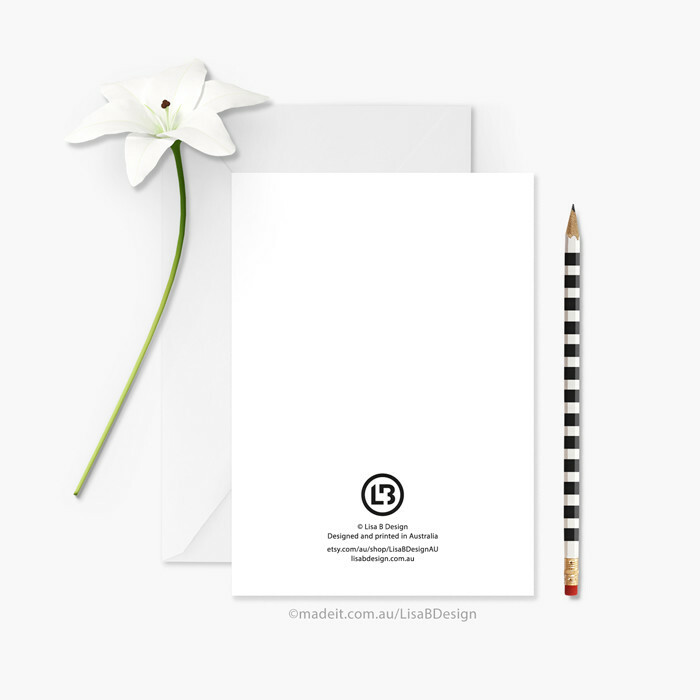 ➤ I can also add a personalised message on the inside (typed, not handwritten) at no extra charge. Please also include this in the ‘message to seller’ section. Your message will be typed exactly as I receive it, including punctuation and spelling. - International orders will be sent via Economy Air and will take approximately 6 to 14 business days depending on where you are located. Please note that I currently only ship to certain countries. While every effort is made to ensure products between computer screens and in print are accurate, colours may vary slightly due to your monitor settings and printer calibrations. I cannot guarantee your item will have the exact colours you see on your screen. Please ensure you have submitted the correct shipping address with your order, as your order will be shipped to that address. If you do enter the wrong address, or if you need to change your shipping address after placing an order, please contact me within 2 hours so that this can be amended. I am not responsible for items that are lost or damaged in transit. If your order arrives damaged, please message me and we can make arrangements for a replacement. I do not offer refunds on items that arrive later than the shipping estimates. All artwork, images and illustrations are subject to copyright and remain the property of Lisa B Design. You CANNOT replicate, copy or use the work in any way without written consent from Lisa Bradbury. This includes any social media content and content on the Lisa B Design website. Purchase of products does NOT include any rights to copy or redistribute the artwork in part or in whole.